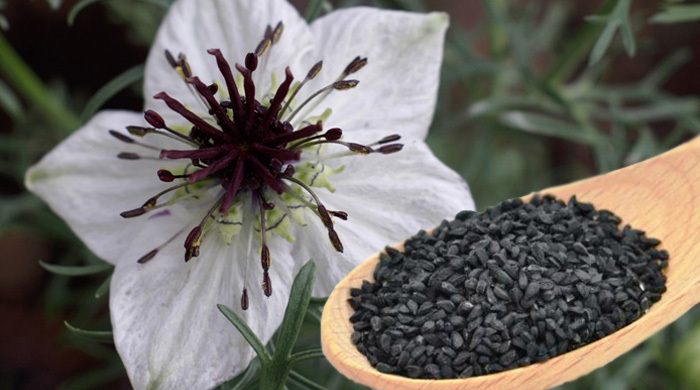 Of all the grow your own seed-spice options I think -- Black Cumin – Nigella sativa -- is a worthy pursuit. Not that I've been successful thus far but this vid is suggestive of it being possibly viable in our climate. I know that it is grown in Bangla Desh and Indonesia which are not 'temperate' zones. Lovely flower. Links in Comments. This appears to be the spice that mum put in cakes and buns and on bread when we were kids. It had a liquorice taste, and I think it is the spice used in Orange Poppy Seed Cake. I did not know you could grow it here in Australia. Perhaps you should not eat Love-in-the-Mist because the seeds 'may' contain toxic alkaloids. But then PFAF says they're edible. Black Cumin, on the other hand, is not only nutritious but also quite tasty.Just as we may keep pepper and salt on hand near the cooking pot, some cultures will also have a jar of Nigella SATIVA seeds nearby. Eaten raw, the seeds have an initial peppery taste in the mouth then a flavor like cumin sets in followed by some underlying bitterness. That then settles into a sort of walnut tang with a drying aftertaste similar to caraway. Like Cumin it's not something you'd drown a recipe in nor eat by the spoonful. There's also the new fashion for 'Black Seed Oil' made from Nigella Sativa. "A remedy for all diseases except death'! However, one study from 2010 indicated that black seed oil inhibits two key enzymes used to metabolise about 75% of pharmaceutical drugs. So be wary of the hype. In the meantime, its spice profile offers some menu options. Penny Woodwood says, "Sow seed into containers in autumn and winter and transplant once the seedlings are big enough to handle, planting in clumps for a more dramatic effect. Flowers appear in late winter, spring and early summer, and once established this flower will self-sow. In very warm regions, protect from the hot afternoon sun. Flowers are usually many different shades of blue, but there are also white, pink and burgundy flowered forms. Both the flowers and unusual seed head look wonderful in flower arrangements, and the flower is edible. The original form of this flower N. sativa, also known as black cumin, has flowers that are not as showy, and is grown for its black, peppery, aromatic seeds that are used as a spice. Seed of both is available from most seed suppliers." https://www.organicgardener.com.au/blogs/love-mist , 2017. I'm tempted to have a crack in pots on my front verandah. Supply for planting. Annual plant producing nice dainty flowers. Commonly used in cooking, seeds are used as a spice in Indian and Middle Eastern cuisine.Annual growing to 20-30cmFull sun to part shad Sow 2mm deepBest in temperate / cool climates but will tolerate warmer zones. Frost tolerant. Seeds germinate best at 15-20 degrees C soil temperature, direct in garden as they don’t transplant well. Health and nutrition:If you’ve never heard of Nigella sativa (also known as black seed or black cumin), you’re not alone. Despite centuries of use as a traditional, alternative medicine, Nigella sativa is off the radar of mainstream conventional medicine. Yet this ancient plant deserves some attention from health care professionals. Several animal studies and some human studies suggest that Nigella sativa potentially could treat common diseases and conditions typically addressed with pharmaceutical drugs. Can be quite pretty in the garden and like its cousin, Love in the Mist, makes a nice cut flower. Taste and usage;Nigella seeds are found frequently in Indian, Middle Eastern, and North African cuisines. This means you can find these seeds in curries and lentil dishes alike. Nigella seeds also pair well with root vegetable dishes as well as squashes such as spiced butternut squash. Many Southern Asia meals can be found with Nigella sativa garnished on top or incorporated into their stir-fry.A popular Bengal spice called “paanch poran” also includes these tasty seeds along with other spices like fenugreek, mustard seed, fennel seed, and cumin seeds. A common use of nigella is in bread and pastries. Often in India, they mix nigella seeds into their traditional naan bread. There are many other unique ways to use nigella seeds; for instance, garnish on a salad for an extra crunch.